People admire innovators. They are always looking to what is new and different. Trustworthy and reliable are all about being predictable. People want to be able to count on a brand to deliver what they were expecting when they were expecting it. Responsive, service oriented and customer-focused speak to putting the customer first and catering to their needs in a timely manner. This implies good listening skills and perhaps even an ability to anticipate customer needs. It also speaks to putting customer needs ahead of one's own needs or at least aligning the two so that they are congruent. A sense of urgency around meeting customer needs is also important. Friendly and easy to work with imply an approachable, easy going brand, not one that has a big ego and is full of itself. Typically, people do not appreciate arrogance, attitude or drama and generally they do not want things to be difficult. Finally, professional and high quality speak to people's need for someone or something that is operating at a high standard of quality. This can imply many things, from substance and competence to a respectful attitude and even a strong command of the English language and a high level of aesthetics. So, while company, product and service brands focus on these adjectives as their most important personality attributes, individuals can also learn something from this list. If the people you interact with on a regular basis were to choose a set of adjectives to describe you, which ones would they choose? Would any of these ten attributes be in their list? This is a useful exercise. Ask people with whom you interact on a regular basis for feedback on how they would describe you. You might even probe for their perceptions of your positive and negative qualities. Good luck. 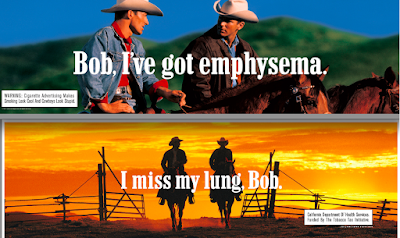 Robert Cialdini of Arizona State University discovered that a new way to counter and dilute a competitor’s message is by creating ads that offer opposing arguments embedded in visuals that link to the original ads being countered. 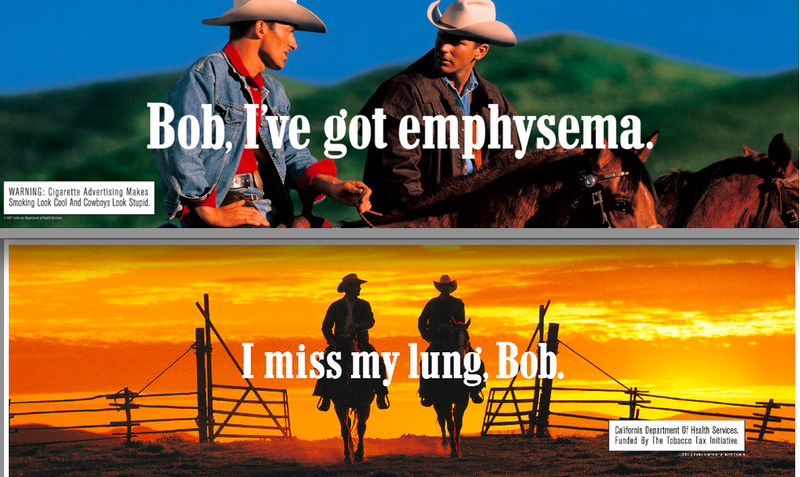 An example is a successful antismoking campaign that featured mock “Marlboro Man” ads depicting macho cowboys on horses in the same rugged outdoor settings as the original ads; however, in the mock ads, the cowboys are coughing and showing other signs of ill health associated with smoking, thus triggering this new highly negative association with Marlboro. Brand Aid, second edition is now available at Amazon.com and BarnesandNoble.com. One of the most important things a brand should do is create relevant differentiation for its products and services. Most brands strive to do this. But some do it far better than others. As you probably know, we spend most of our time helping our clients craft brand strategy, including the brand’s promise and its unique value proposition. We draw on in-depth qualitative and quantitative category, customer and competitor research, brand equity studies, the organization’s core competencies, management’s strategic intent, and the knowledge and creative intuition of many informed individuals. When we arrive at a brand strategy that has widespread support throughout the organization, it has been well vetted as the most advantageous approach. The way we have arrived at this is not trivial, nor is its conclusion. The next step is the frequent source of significant difficulty. Now it is time for a creative team to translate the brand strategy into a name, tagline or marketing campaign. Some brand promises or unique value propositions are extremely difficult to translate to a pithy tagline or campaign, especially one that has not already been used by another organization. And creative people don’t like to be constrained. If they come up with an idea that they love, it doesn’t matter if it is off strategy. They know they can sell it anyway because it is brilliant (and maybe it is). The problem is, it does not reinforce the brand strategy. This compounds the problem - some clients are not sophisticated enough to reject creative content that may be compelling but off strategy. They are carried away by the creative content while contracting amnesia about the agreed-to brand strategy. Here are some ways to mitigate this problem. If you are in charge of developing the creative content in support of the brand strategy, NEVER present a creative option that is off strategy. If other people are developing the creative content, invite them to be active participants in (or at least observers of) the brand strategy formulation. Also, establish creative content evaluation criteria that includes “reinforcement of the brand’s promise and unique value proposition” as a primary criterion. If you succeed in your brand strategy formulation but then stumble in translating that to creative execution, all of the previous work has been for naught. Don’t let down your guard during creative translation of the brand strategy. Be ever vigilant in seeing a strategy through to its proper execution. I wish you much success in doing so. Social media is another way to reach out to brand fans. It helps your brand remain top-of-mind, creates a dialog with customers, provides useful feedback, and can be the source of brand information and special promotions. At a minimum, you need to be familiar with the following social media sites: Facebook, LinkedIn, Google+, Pinterest, Twitter, Instagram, Tumblr, and YouTube. According to Millward Brown, a brand’s social media fans outspend non fans four to one. Furthermore, Millward Brown indicates that the following are the top four most valued fan page benefits: 1) latest news about the brand, 2) new product information, 3) contests and giveaways, and 4) sales, discounts, coupons, and special offers. Social media is also a useful customer input and feedback mechanism for major product and service decisions. In fact, many brands are now using social media to co-create the brand's products, services and programs with its customers. Whether it is a simple question, a short survey, or a longer focus group, marketers are using social media for marketing research. And the questions and answers can be interactive synchronously or asynchronously. And social media takes customer relationship management (CRM) to the next level. It allows the brand to have conversations with specific customers over time, not only providing for better understanding and documentation of individual customer needs but also as a way to build an emotional connection with the customer. The best websites integrate social media into the site and blogs have social media widgets so that their information can be easily spread through social media. If you are responsible for building your brand's equity and sales, don't neglect social media as a tool for achieving that end. (c) 2014 by Brad VanAuken, excerpted from Brand Aid, second edition, now available at Amazon.com and BarnesandNoble.com. Once a brand has been established, it is difficult for people to give it up. They become emotionally attached to it. It may even be a source of self-esteem and personal pride. They invent a variety of excuses for why it should never go away. The people I am talking about are not the brand’s customers or consumers but rather its creators and caretakers. Often, brands create as much or more of an emotional connection with the people who manage them as they do with the people to whom they are marketed. Therein lies the problem with organizations that are skillful and prolific at creating new brands or that have grown through numerous mergers and acquisitions. We have been retained by many an organization that needs to simplify its portfolio of brands. The complex brand structure usually results in increased complexity, cost and customer confusion. However, the brands are entangled in so many ways with their individual support systems, including their dedicated managers and teams, that they are very difficult to terminate. How likely is it that the person who created the brand or currently manages the brand will say, “yes, my brand should go away’? Not only does that person understand the brand’s equity, consumer franchise and complex expressions but that person’s ego, and perhaps livelihood, also depends on the brand’s survival. This is where the senior most manager’s perspective and leadership skills are required. Someone needs to have the broader perspective and to make the tough decisions. As importantly, that same person needs to make it safer for those who are likely to fear harm and experience personal loss by the brand consolidation process. As much as I am a fan of brands, sometimes organizations have too many brands. When that occurs, one needs to revisit the organization’s brand portfolio and simplify the brand structure. As consultants, we can help with the brand rationalization process. However, the process is aided immensely when the organization’s leader is willing and able to anticipate and manage the inevitable human resource consequences of the process.